I don't think anything makes my heart race and beat happy more than finding an awesome piece at a thrift store for very little $$ (well maybe except a good surgery on Grey's Anatomy). Moving on. I'm going to apologize in advance for not having a better before picture. You know when you get into a project and you are just so dang excited?? That happened. This baby was $49 at Goodwill. It had been marked down from $69 earlier that day. It was one of those play it smooth and don't act too interested in it so you don't draw attention to yourself in the store. There was another couple "sharking" it. Sharking is what I call it when people circle and circle an item multiple times. I totally had to play it cool and act like the bottom drawer wouldn't shut. The mirror that went with it left much to be desired, so we (for the time being) decided to not use it. You can see it in the background of this picture. The top was beyond damaged. It wasn't even real wood. It was some sort of hybrid particle board that had been water damaged. And water damaged particle board is beyond helpless. 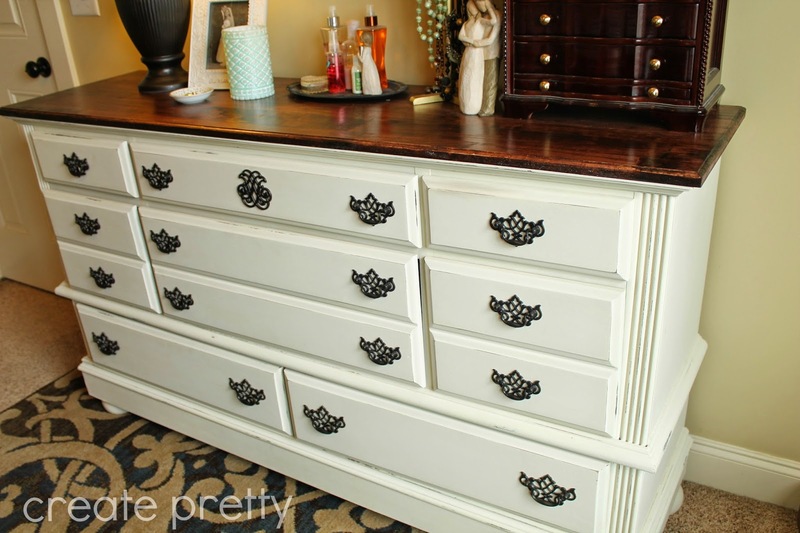 drawers were painted and the hardware was replaced. I really liked the handles. I feel like keeping the original character of pieces is important and I just really loved these. I'm not against adding new knobs. But if they work- go with it. They got a fresh coat of oil rubbed bronze* paint. This stuff is the bomb. I used this paint to spray all our door handles in our old house. It goes on really in one coat. I always do 2 just to be sure and it LASTS. Super durable with very little effort. Meanwhile Josh was working on rebuilding the dresser. There was significant amount of damage to the bottom pieces so he replaced those and reinforced the whole thing with an extra 2x4. I looked at some inspiration photos and realized that the ones I loved had chunky feet. So I asked for chunky feet! Love these guys! Next up was cutting the top. We used a high quality piece of aspen wood. It was not in the "raw" wood section of Lowes but rather in the finished wood section. We spent almost as much on the top as we did on the whole dresser. But in the finished product, the top is the show stopper. I really wanted it to be NICE. After he cut the piece to fit the dresser, he had to router the edge. His router is actually missing a piece so this was easier said than done. Here he was practicing and it definitely got worse before it got better! Once the top was cut it was time to stain. In my very VERY limited staining knowledge I have learned that preconditioning* the wood is a crucial step. CRUCIAL. Don't take short cuts here. I kind of compare it to putting the right moisturizer on before applying makeup. It helps the top layer look it's best. I was so excited to get that stain on there! And boy it didn't disappoint! The color is Red Mahogany by Minwax*. We tried our best to match the stain to our bed since we don't have any pieces in there that match. If you don't have the Mixwax stain brochure with all the colors... you should. It's a lifesaver when you get to the store and are smacked in the face with 20 different browns. While the top dried (I applied 2 coats about an hour apart and then finished with Minwax's Polycrylic*) I got working on the drawers. I really dreaded this stage. But it wasn't as bad as I thought. I started by prepping the surface with this liquid sandpaper (which is also a deglosser). This saves a step since it cleans and deglosses* in 1 step. No need to clean beforehand because this stuff will take off any gunk. Then I lightly sanded with 150 grit sandpaper*. I didn't really sand too hard. I wasn't trying to take all the stain off, just buff the surface and prepare it for paint. I missed taking a picture of the next step... sorry about that. After sanding wiped all the remaining dust away and sprayed it with Rustoleum's primer. That gave it a good prepped surface, ready for paint. The only problem? The paint. Oyyyy I hate making decisions. We had a tiny bit of trim paint leftover in our garage and I used it for Luke's accent wall in his room. The can didn't have a color (must have had a bunch mixed at once) so I had to guess what color it was. I really wanted to stick with the trim color so we didn't have too many whites/creams going on. This is the color I settled on. Behr's Lunar Light in Matte (Flat) finish. I tried to test it in not an obvious place that got good light. Sorry about the toilet in the background. I knew that given the type of wood I was painting and the fact that I didn't prep it with an electric sander that I wanted to use chalk paint. 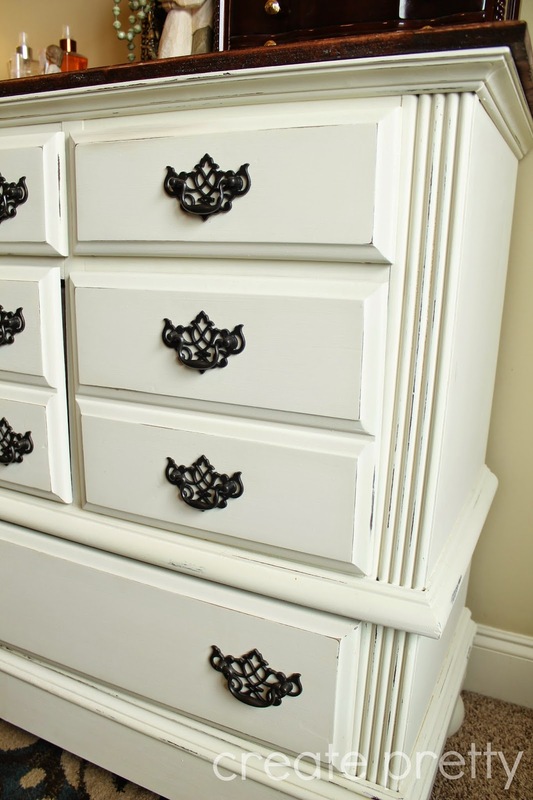 I have dabbled in chalk paint briefly last year and was super impressed by it. This was a pretty big project so I was a little intimidated but ready to get to work. I bought the calcium carbonate* on Amazon and mixed about half a cup into the yellow cup. Then I filled the paint up to almost the top (I left enough room to stir the calcium carbonate up). I try not to add too much calcium, but you want to add enough. The mixture will look lumpy. And it may even paint on lumpy. But as you apply the strokes the lumps will disappear. You really can't go wrong with calcium carbonate. And if you have any lumps leftover let them dry on the piece and lightly sand afterward. Remember it's chalk paint so it's going to have an unfinished feel. It took 2 coats to get a flawless finish. And it only took about 1/2 an hour to dry between coats. 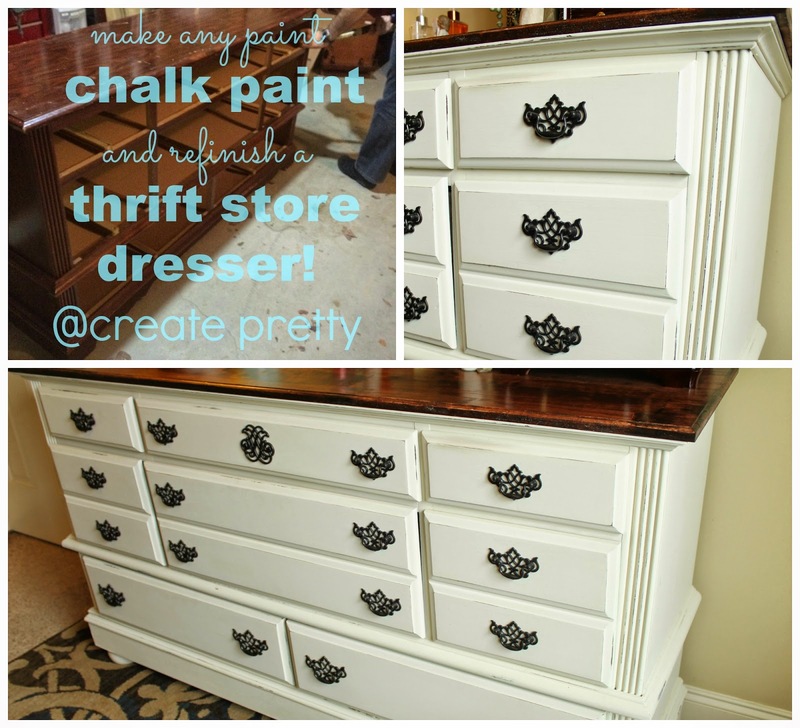 That's the benefit of chalk paint! Probably the most fun of this whole project was lightly distressing it! I just used the 150 grit sandpaper (although 220 is ideal). I tried using steel wool, but it just didn't work as well as the sandpaper. The steel wool almost left the cream dirty. I really love how distressing really allowed the lines to pop! I was able to add the handles later that day and we were well on our way to being finished. The final step I did was wax. This was my first time using finishing wax. 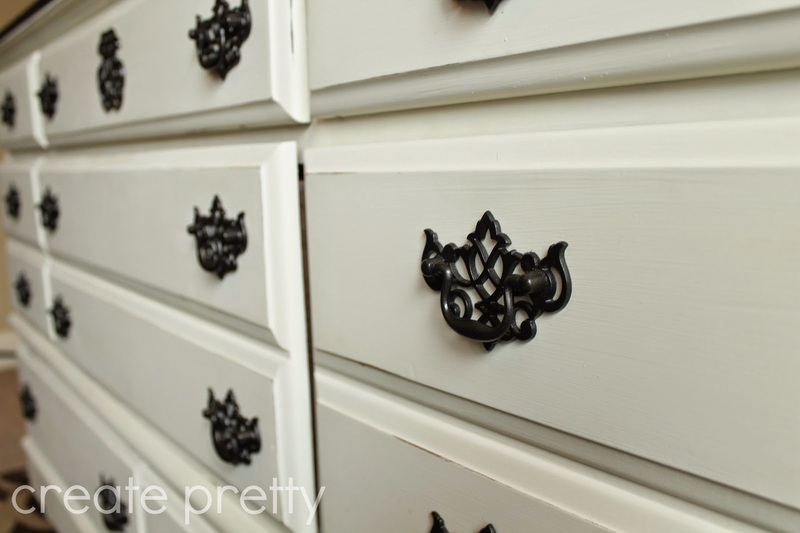 If you are familiar with Annie Sloan chalk paint she apparently has a great finishing wax. From doing a little research, I found that in order for furniture to not have that chalky feel the wax is the secret. But when I couldn't get AS wax (not sure of the price anyways) and when this popped up on Amazon*, I jumped. Finishing wax was very interesting to work with. It was much harder than I thought to apply. I didn't use a brush (like the directions say) but instead used a few old rags (like some tutorials said). 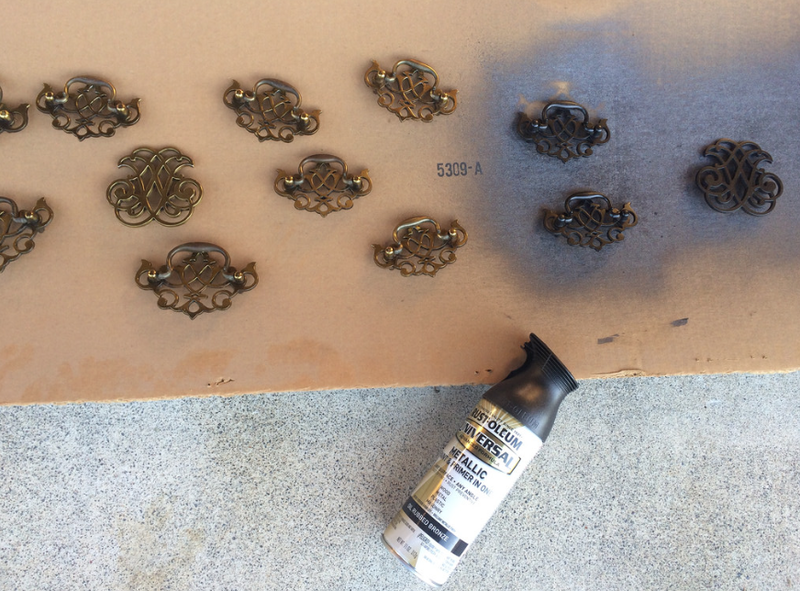 Overall it was a difficult product to use and the fumes were ROUGH, but it really added a nice finish. I guess you could use a clear coat instead, but I didn't want a shiny finish at all. This adds more of a matte finish. Definitely want to try a stiff stencil brush next time. All total it took about 3 days from start to finish. Of course we did it over about a week, but 3 actual days of work. I thought the drawers would take the longest, but actually the dresser part took the biggest chunk of time. This shows you the whole wall that I am working with. I'm not sold on our lamp. And I'm still not set with the mirror. But overall I'm very happy with how this wall is coming together! Now the fun part! We've had red accents in our master for the last 7 years. And while I love a moody red, I'm over it. So when I decided to start thinking about this room I realized I could choose any color my heart decided. Our entire master bedroom (and house for that matter) is tan, so dreaming of master bedroom colors has been so fun! We aren't quite ready to pull the trigger, but I wanted to choose a paint color so we can begin accessories and bedding. Here is my inspiration. For the last 5 years my dad has given my mom and I matching Tiffany's jewelry for Christmas. It's become a tradition and while I know what I'm getting each year, it's always a surprise what he chooses. And I love aqua. 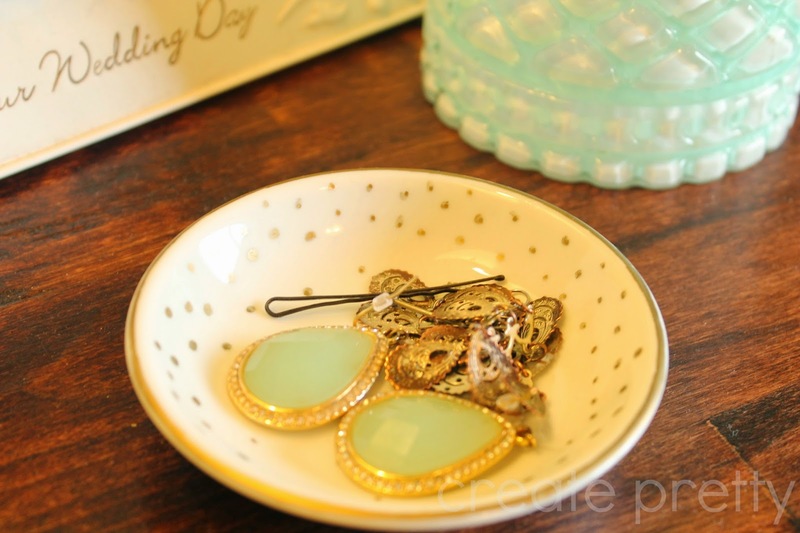 So Tiffany blue it is! I plan to do an accent wall with aqua and then the other 3 walls gray and our master bath aqua. 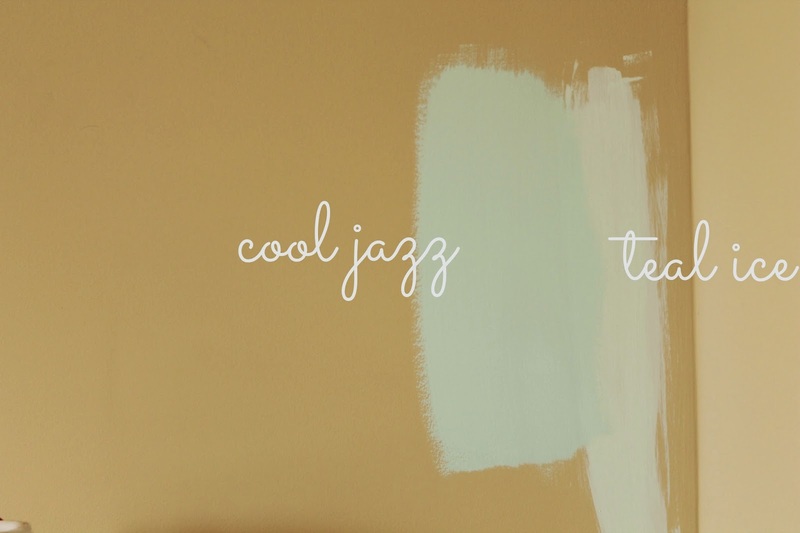 I think I've decided on Cool Jazz by Behr for the color. The teal ice was just a smidge too light. I will never use anything besides Behr. I just love their colors and the paint goes on super smooth! I mentioned earlier that I hate choosing paint colors and we have an interesting dilemma here. In both kid's rooms (here and here) and their bathroom (coming in January!) I opted to paint their ceiling the color of their walls. Reason? 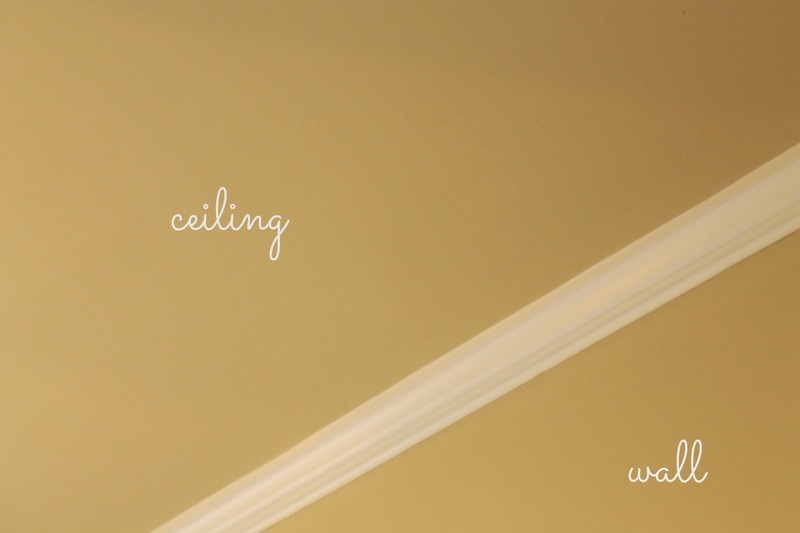 Because our whole house has tan ceilings. BUT this room (since it's the master) has crown moulding. So as I was choosing the dresser color I needed to keep that in mind. 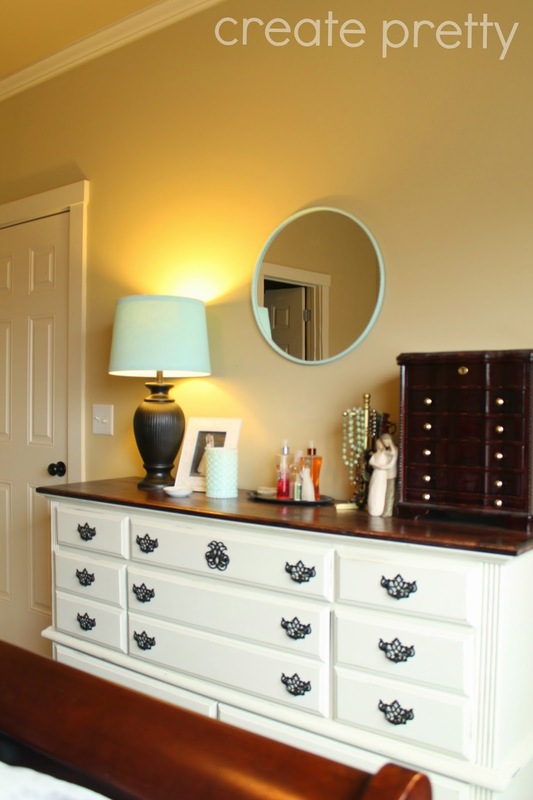 I wanted to use the same gallon of paint for the dresser as well as the ceiling. I'm really excited about it lightening up the whole room! Also when I chose the Lunar Light color I went with the paint/primer combo. It was a little more expensive than a regular gallon. I did this to hopefully save a coat or 2 on the ceiling. Hoping to cover this tan with cream in 2 coats! **Contains affiliate links. See my disclosures here.